This month, the EU hopes to conclude the Copyright in the Single Digital Market Directive, with no sign that they will improve or delete Articles 11 and 13. This is a dangerous mistake, because these articles have the power to crush small European tech startups, concentrating power in the hands of American Big Tech, while exposing half a billion Europeans to mass, unaccountable algorithmic censorship. 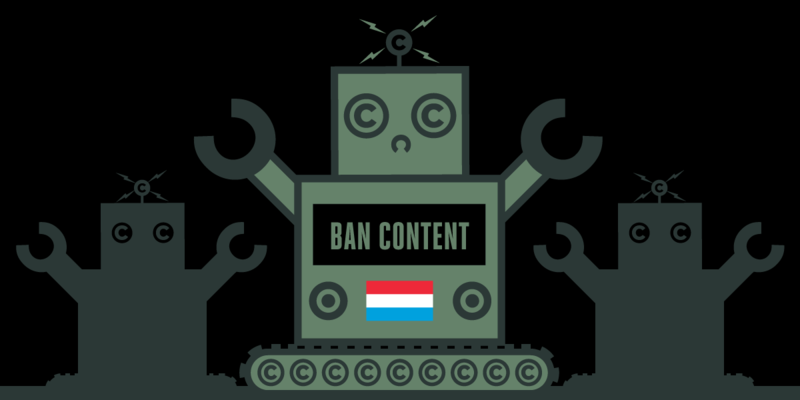 We had hoped that the EU and national government negotiators would delete Article 13, the “censorship machines” rule that requires online platforms to hand their users’ videos, texts, audio and images to black-box machine learning filters that would unilaterally decide whether that content might infringe copyright and thus whether it should be censored or allowed to be published. Instead, the current text goes to enormous lengths to obscure its mandate for AI filters. The new language says that filters “should be” avoided, and that companies can escape liability if they use “best practices” to fight infringement. But the rule also says that the limitation of liability doesn’t apply where there is “economic harm”—meaning that a user has any commercial content—and it also requires “notice and staydown,” which means that once a platform has been notified that a given file infringes copyright, it must prevent all of its users from ever posting that content again. Thus, Article 13 can only be satisfied with filters—filters like the ones that Tumblr has been using in a disastrous attempt to block adult material. Article 13’s filters will have to process vastly more materials, in every format, and they will not fare better. And since Article 13 penalises companies that allow a user to infringe copyright, but does not penalise companies that overblock and censor their users, it’s obvious what the outcome will be. Building Article 13’s filters will likely cost hundreds of millions of euros, a price that only the biggest US firms can afford and none of Europe’s companies can bear. The exemption that allows firms with less than 20 million euros in annual turnover to avoid the filters is irrelevant: if these companies are to challenge the US giants, they will have to grow, and they can’t grow past 20 million euro businesses if that means finding hundreds of millions of euros to comply with Article 13. Meanwhile, as the number of tech companies controlling access to the Internet dwindles, their power will grow. The ability of independent artists to and production companies to negotiate fair deals will steadily weaken, allowing Big Tech and the big entertainment companies to command an ever-larger slice of the product of creators’ labours. Article 11, the rule banning links without a license, is also bad news for small businesses already struggling with abuse by the US ad platforms. While the giant newspapers will be able to afford to link to one another after Article 11 is law, these smaller news entities will have to find cash they don’t have to pay for these licenses, and nothing in Article 11 requires newspapers to sell licenses to them at any price, let alone at a fair price in line with the sums paid by the other establishment news entities. To make things worse, Article 11 has no opt-out: every news company must charge for links, and so the burgeoning world of Creative Commons, nonprofit, public interest news sites is snuffed out at the stroke of a pen. Of course, the vast majority of Europeans are not in the entertainment industry, and only a tiny minority of the Internet’s uses are entertainment-oriented. Article 13 will hold the Internet usage of 500 million Europeans to ransom in a harebrained scheme to eke out tiny gains in artists’ livings, and in the meantime, the censoring filters of Article 13 will churn out the same useless, error-prone judgments that have come to epitomise algorithmic discrimination in the 21st Century. It’s not too late: the European Council—made up of representatives from EU member states like Luxembourg—now get to negotiate the Directive. Their decision will shape future of the Internet, possibly for generations to come. We need you to act, to tell your representatives to strike a blow for fairness and against market concentration and censorship.